Wit Goud, Belgian’s first Witloof Bier from Farm-Brewery Hof ten Dormaal. André Janssens, the master-brewer at organic farm-brewery Hof ten Dormaal is proud to present “Wit Goud“. Wit Goud is the name for the beer that is made with home-grown chicory (witloof in Dutch) at the farm-brewery. In fact André grows his own barley, hops, chicory himself at the farm. Even the energy used during the brewing proces is bio-organic, the left-over residue is given as feed to the livestock at the farm in Tildonk-Haaght. Wit Goud is the beer a lot of people here in Belgium were waiting for to be brewed. 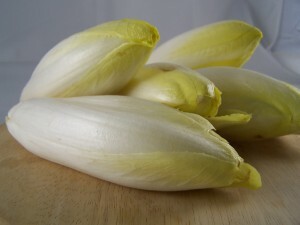 I like the typical bitter-taste from the chicory. Nice and crisp. Belgiuminabox whishes André good luck with his new brew. All beers from Hof ten Dormaal are now available at the Belgiuminabox beer-shop. Author KurtPosted on March 21, 2011 Categories Other Belgiuminabox TopicsLeave a comment on Wit Goud, Belgian’s first Witloof Bier from Farm-Brewery Hof ten Dormaal.